The Broccoli Soup rounds out our trip to Sweet Tomatoes. This is a lighter version of the soup than what we are used to. Please do not keep this soup for a long time, it will not hold as nicely as other soups do. It is lower in fat. 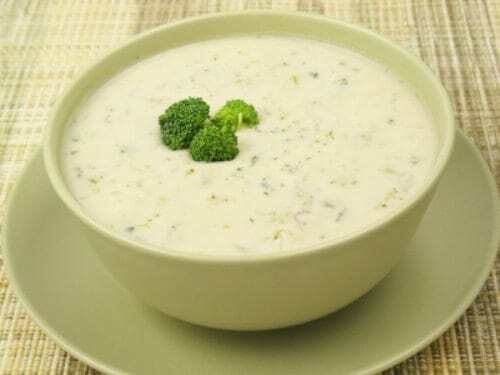 You can make a bowl of the Sweet Tomatoes cream of broccoli soup at home. Simmer Broccoli and onions in 4 cups of water until the broccoli and onions are tender. Remove 3/4 cups of broccoli heads and set aside. Cook the remainder of broccoli and onions until soft. Remove from heat and strain broccoli and onions. In a blender pour remainder of broccoli and onions add celery salt, seasonal, sugar and milk. Blend until all are smooth. Pour mixture into a saucepan, add the 3/4 cup of broccoli and simmer on a medium low setting for 20 - 25 min.Great served with crusty hard rolls and a selection of cheeses. Just came from Sweet Tomatoes and loved this soup so I went directly to you to see if you had it — and you did!! This was wonderful! Two of my favorite things together in a soup!